Arrival at Cesky Krumlov just before noon. ERT is valid from Monday to Friday between 9 am and 3 am (next day) and all day on Saturdays, Sundays and holidays 0 – 3am (next day). ERT is valid on the following regional passenger trains of ÖBB: Regionalzug (R), RegionalExpress (REX), S-Bahn, Regio S-Bahn (RSB), EURegio (ER), Erlebniszug (EZ). 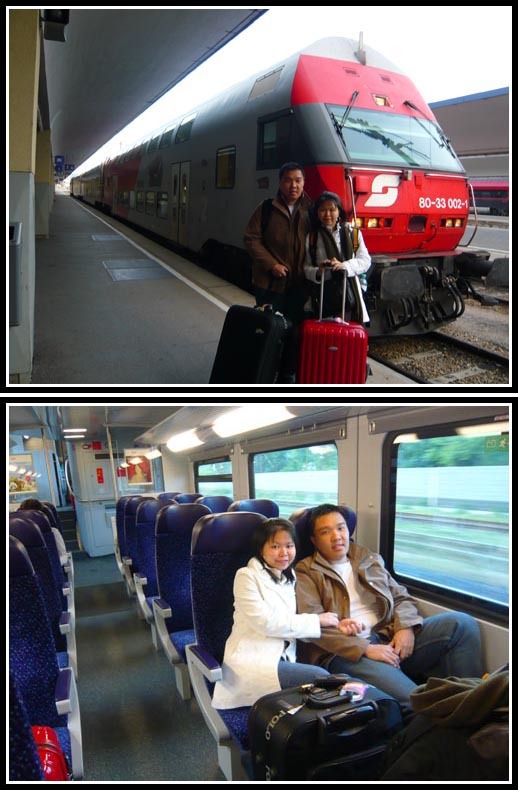 Since there are 4 of us, it will cost us only 7 Euros to travel from Vienna to Linz by train on a Sunday morning. As this ticket is not valid on express train which goes straight from Vienna to Linz; we had to take an earlier train and change trains at St Valentin to proceed to Linz. The train departs from Vienna at 6:30 and arrives at St Valentin at 8:40 and the train leaves for Linz at 8:43 so you have only 3 minutes to change the train but don’t worry, the trains are separated by one platform and you should be able to reach in less than 1 minute (with luggage). If you miss this train, the next one comes at 9:55. To find a suitable schedule for an Einfach-Raus-Ticket, you can go to OBB’s Routeplanner site and select destination and Product (Einfach-Raus Ticket). The train ride to Linz was much more comfortable compared to the Krakow to Budapest train we experienced earlier in the trip. Don’t be confused if the train stops at some stations that is also called Linz e.g. Linz Sudbahnhof. You should get down at Linz Hauptbahnhof (Main Station) for the shuttle to Cesky Krumlov – the train from St Valentin terminates here. This completes the first part of the journey from Vienna to Cesky Krumlov. Where to meet at Linz Hauptbahnhof? The station is rather big and has many different exits. We arrived at Linz Hauptbahnhof at 9:08 and we had 1.5 hours before the shuttle arrives. I assumed that the shuttle will pick us up at the only carpark in the station. To reach this carpark, just take the escalator near the ticket office up to the Ground Floor. Thankfully, Sebastian (our shuttle driver and owner of the company) arrived with its prominently marked white van on time at 10:30 to pick us up to Cesky Krumlov. Sebastian is a friendly guy and kept us informed of the best places to eat and see in Cesky Krumlov during the 1.5 hours drive. If you are exploring transport options from/to Linz/Vienna/Salzburg to/from Cesky Krumlov, his company takes care of it all at reasonable prices – he also owns an accommodation (Pension Sebastian) in Cesky Krumlov. Check out all Cesky Krumlov tour options available at his Sebastian Tour and Transport website. I’m trying to find out the route from Cesky Krumlov to Vienna. Understand I can take a shuttle bus from Cesky Krumlov to Linz, and then a train from Linz to Vienna via the ERT ticket. Do you reserve the ERT ticket in advance before you go on the trip? Or you bought it over there on the exact departure day? I bought the ERT at Vienna 2 days before cos we were leaving on an early train. do you think it’s possible to buy the ticket on the day of departure? Say for instance, I reach Linz on 28/01 and buy the ticket from Linz to Vienna on the same day? The ERT is not a point A to point B ticket – its like a day pass so should be ok to buy on the spot – so take note of the ticket counter’s opening hours if you are leaving on an early train. Ur info is very helpful. I search the web and find out there are several shuttle companies to choose from, are u happy w/ the service of Sebastian ? Would u recommend us to use it? We will need shuttle from Salzburt to CK to Vienna. Not sure if you will be able to answer this question. After I got your recommendation about Sebastian, I pretty much went ahead and make a reservation, but it was by then I realized they charge full price for my 18 months old toddler, the reason is, he is taking up a full seat and he needs to be in a car seat, like in US. This is understandable. So I send out a few emails to other shuttle companies that provide the same services and one gave me 66% off, they only charge 1/3. But I don’t know if they are reliable. So my question to you is, besides Sebastian, do you or your friends know of or have used other shuttle service that’s reliable and recommend to us? During our trip, there were 4 adults so this wasnt a problem – I had compared a number of shuttle companies earlier; only sebastian was able to offer a 10am shuttle at Linz at a reasonable price – other shuttles is about 12-2pm and I didnt want to wait at Linz for that long. Perhaps you could take into consideration timing too. 🙂 I had not tried other shuttles but if the timing and price is right, then no harm trying others since its only a short 3 hour trip. Is it possible to get the Einfach raus ticket online earlier? Prefer not to rush through things cos bringing a little one with me. Thanks. dont think its possible to get the ERT online. The ERT is not a ticket to a specific place but just sort of act like a day pass – so unlikely it will be sold out. How do you buy the Einfach-Raus-Ticket (ERT)? Online or at the train station? i bought it at the station – dont think you can buy ERT online cos’ its not for any fixed directions. Very kind of you to share this useful information! 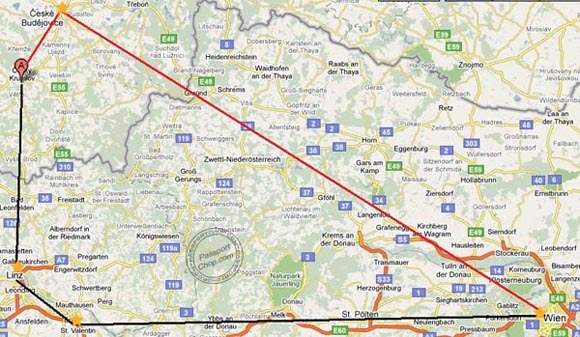 I plan to do CK – Vienna and wonder if there is a cheaper way to go from CK – Linz apart from shuttle bus? Moreover, my destination is actually “Wien Sudbahnhof” but assume ERT doesn’t operate until there, so I have to buy another ticket “Wien Westbahnhof” – “Wien Sudbahnhof” the same time in Linz? Shuttle bus is typically the cheapest and most convenient way to get to Linz (Train you have to change and takes longer). Travel by certain trains is covered by ERT – generally the express trains are not covered – so you might want to check with the train station. Thanks Shawn :-). The shuttle service from Linz to CK takes large luggages – if its just 2 of you, certainly no problem – we had 3 big luggages + 3 cabin-size luggages – it fitted in quite well. For Amsterdam to Prague, suggest budget airlines e.g. easyjet, ryanair; not sure if there is an overnight train that takes this route. For Prague to CK, Student Agency Bus. From CK to Vienna, can consider the route we took (via Linz) as suggested in this post if its more economical (we had 4 travellers so the ERT gives us good savings) or a direct shuttle from CK to Vienna if it fits with your budget. From Vienna to Budapest, Orangeways Bus and from Budapest to Amsterdam, can take budget airlines e.g. Wizzair (the Hungarian airline). Hope this helps. For what to do in these countries (except Amsterdam), can check our our posts in the relevant sections. Although if you havent been to Belgium, France, these places are great for exploration and easy to travel from Amsterdam. Sorry last few qns, for CK->Vienna, Student agency gives quite a best price 16Euro each. Only 2 of us going. Just want to ask the student agency bus is it comfortable& convience for CK to Vienna? We most likely confirm take this bus from Prague to CK but CK to Vienna is 5 hr journey for student agency bus. Any advise please? The direct shuttle from CK to Vienna i am referring to private transfer not the student agency one – 5 hours on a bus might not be very comfortable. Alternatively, if your budget allows it, get a private shuttle (not student agency bus) that goes direct to Vienna – could be quite expensive (dont remember the price). Or you can take sebastian shuttle to Linz and then train from Linz to Vienna (as described in this post but reverse order). Took the CK shuttle from C Krumlov to Vienna last week and do not regret it. Paid about 1100 Czech crowns for the trip. Unlike other shuttle services they pick u up from your hotel and drop off right at your hotel in Vienna. Worth it if you have luggage as it can be difficult to change vehicles many times. Might get a bargain if you wait until the last moment as they have some great “last minute” offers, I booked my shuttle in advance at the highest price though. Sorry Zhiqiang is me to disturb you again. Oops.. 🙂 When you go prague and budapest, the money currency you change in sg or there? I booked the bus from Linz to CK and booked the Pension Sebestian, but the feeling is very bad. 1. The price for pickup from Linz to CK they gave me is CZK399/person. After I arrived the Pesion, it is clearly stated on their board that such pickup is CZK390/person. Small money as it is, but it doesn’t make me feel good. 2. The pickup bus is a old and shaggy van instead of the car shown in this picture(PEUGEOT). I asked the owner in advance and he said he didn’t have such car (then what we saw in the picture?) The owner outsouced to another Czech driver to pick us up while letting his more comfortable car stay at home. 3. The pension is basically out of the town, and needs 15-20 minutes to get to downtown. It might seem not far away, but CK is REALLY a small town. 4. The pension is just besides the main road. In the morning I was woken up by the sound of the car engine, then I understood why they put earplugs onto the small refrigerator. 5. The breakfast is one plate for TWO person (some cheese, tomato, sausage slices). Imagine that! 6. The towels are changed every two days. You need to ask if you didn’t realize that and don’t expect to get a happy face. 7. These are the hard facts. I wouldn’t mention other soft part since it may vary according to different people. Anyway, CK is a beautiful town, yet stay away from this pension! oops – looks like the service has changed since; thanks for the heads-up, Bill. I had stayed at the Krumlov House (not Pension Sebestian) and used his Sebastian’s shuttle service as it was the only one from Linz with good timing. future travellers intending to use Sebastian’s shuttle service, pl be aware of Bill’s advice and check with Sebastian on the shuttle used and avoid his pension. Oh! that should feel so bad , I am sorry to hear that , I do avoid going to his Pension. Was wondering is there a rental car agency or a place to rent a car from Vienna to CK . Thanks. Geez, that’s uneblielvabe. Kudos and such. 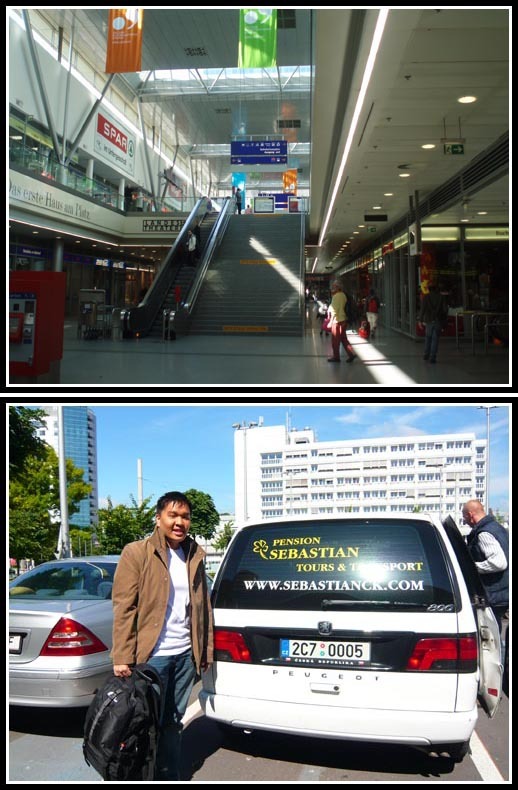 Hello, I am the founder and owner of Sebastian B&B and Sebastian Tours & Transport. I would briefly like to comment this review if possible. 1. The prices we display on our board in the house are last minute prices and obviously only from Cesky Krumlov to Linz. If I am not mistaken we actually sent the car to Linz that day for the 2 of you only as you were our guests (normally we need at least 4 pax not to be in lost). Regular price is 399,- CZK (some 17 EUR) for door to door service. Price for a train ticket from Linz to Ceske Budejovice only cost some 20 EUR, there you have to change etc… The choce is always up to everybody. 2. I have no idea where you could see our old Peugeot car but deffinitely we do not advertise it anywhere as we sold this car 2 years ago. Since then we have bought 2 new cars. The other part about leaving our better car at home?? I cannot comment as I do not understand it at all. 3. Yes, CK is a very small town which can be easily crossed on foot from one end to the other in 25 minutes. We are located some 3 minutes slow pace walk from the old town and another 5 minutes walk to the sign where the very center starts. Please see the map. Vas majority of tourists come to Cesky Krumov to walk and sightsee and on the contrary most of our guests appreciate the walk to the center as many people staing in the center never make it to this part of town which is not less intersting. 4. We have had many guests (having been in CK before) who are staying with us mainly because they want to get away from the permanent noise from all the restaurants and bars in the centre and the all time music festivals and concerts which are on until late. Unlike all the pensions in the town centre that have simple wooden windows (due to historical restrictions) our house has got new soundproof plastic windows. The ear plugs are simply another extra thing which guests can use when their counterparts snore etc. Almost nobody uses them but everybody appreciates they are there when needed. How do you sleep in Vienna or Prague? 5. The breakfast everytime consists of corn flakes, muesli, yoghurts, bread rolls, butter, various marmelades, honey spread cheese etc. and coffee & tea. All at your unlimited disposal + there is always something extra such as cold plate of various cheeses, ham, salami, vegetable, or an egg omelete etc. For most people this is more than enough. 6. Yes the towels are changed every 2 days as every person receives 2 (two) towels per day. Again for most people this is more than enough. 7. I belive that the hard fact is that somebody who decides to pay 45 EUR per room / night including breakfast, parking and all the fees shouldn t expect Hilton or Marriott services as it is impossible and they will neber be content and happy. Thank you for letting me comment this review. I’m planning for a trip to Vienna & Prague. 1) In Vienna, which would be better? To stay in an old pension that is highly raved for good servie and is situated in the city centre (district 1) or to stay in a new hostel (Wombat’s, near the Naschmarkt)? I’m pretty particular about cleanliness. 2) How many days do you think is needed minimally to enjoy Vienna? and Prague? 3) I wonder if you have come across any trips that start from Vienna, pass by CK before getting to Prague. Wombat is quite clean. Not sure abt the old pension – if location is good – then can consider, you save on time travelling. Vienna – about 3 days should be adequate; Prague, depends if you are going on day trip to Karlstejn or Kutna Hora like us – otherwise, 3 days should be adequate too. Hi there! Thank you so much for this blog post – I realize it’s been three years since you’ve posted but it’s been vital in helping me plan for our trip! 15 – 20 minutes if you walk at an average pace and know where you are going (refer to the blog post for instructions but its been 3 years, the platforms might have changed due to renovations). If you are disembarking from the train to meet Sebastian, dont think its a problem if you are slightly late – just let sebastian know in advance. I’m planning a trip to Cesky Krumlov and come across Budweis-Shuttle in a couple of websites including Trip Advisor and ckrumlov.info. I traveled from London to Prague Airport. And for two days I traveled from Cesky Krumlov to Hallstatt. This company has a good price and peferct service. I recommend to all.